7,336 World War II Veterans of Molesworth, are returning HOME!! 2/28/2008 - ROYAL AIR FORCE MOLESWORTH, England -- The World War II records of the 7,336 airmen of the 303rd Bomb Group (Heavy) who served with the B-17 'Flying Fortress' unit at Molesworth 1942-1945 will officially become part of the group's legacy at the JAC in a ceremony on March 13th. Keeping the proud legacy of the 303rd BG alive in the minds of the soldiers, sailors, airmen, marines and civilians that serve today at RAF Molesworth has always been an important mission for the JAC. Researching and assembling these records has been an amazing epic 20 year journey for one dedicated man, former 303rd BG B-17 pilot and retired Air Force Lieutenant Colonel Edgar Miller. His work is covered in a recent article in the "Citrus County Chronicle" of Crystal River, Florida where Lt. Col. Miller now lives. The article by retired Army Col. Curt Ebitz is quoted with permission. 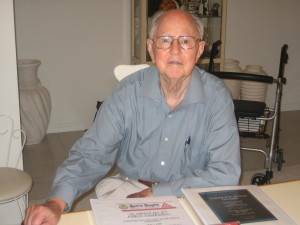 "As a young man in his early 20s during World War II, retired Air Force Lt. Col. Edgar "Ed" Miller was on a mission. His mission took him to the flak-filled skies over Nazi Germany as a co-pilot and pilot of a B-17 bomber of the 303rd Bombardment Group (Heavy) based at Molesworth, England. Miller survived 30 bombing missions, even though 10 of them took him to the heavily defended Nazi capital of Berlin. Given the city's high concentration of air defenses, Miller believes he is among the lucky few and quite possibly the only 303rd Bombardment Group pilot who completed 10 missions to Berlin and lived to tell about it. "The 303rd Bombardment Group flew 364 missions, the most of any of the 60-plus bombardment groups flying out of England, suffering the loss of 882 crewmembers killed in action and 772 who became prisoners of war after being shot down. Because of the high casualty rate, Miller, like most combatants, made it a point to neither make friends nor learn much about his compatriots. "That would change at a reunion of the 303rd Bomb Group Association 40 years later when Miller became membership chairman. He embarked on another mission -- to record for future generations the legacy of the men who valiantly served in the 303rd Bombardment Group. "Starting with 385 names of 303rd members on 3 x 5 cards, Miller began the arduous challenge of collecting and alphabetizing the names of the 7,336 personnel who passed through the 303rd. "By the end of the first year Miller had a database of 1,200 names. After acquiring and reviewing 125 official orders, the names grew to more than 3,000 by 1989. By 1995, the list of names reached more than 5,600. Finally, the remaining names were discovered in 2004 when a copy of the 303rd's personnel movement order for its September 1942 transoceanic trip to England aboard the 'Queen Mary' was found. "Miller's 20-year labor of love has become an epic historical work of several volumes. The first volume is titled, "A Group of Heroic 8th Air Force Comrades." Arranged in six binders with more than 1,800 pages, it contains the alphabetized names of the 303rd's 7,336 wartime members, to include rank, service number, squadron assignments and duties, as well as the crew position and number of missions for each flying member. "The second volume, "Personnel Casualties of Triangle 'C' is arranged in five binders with 1,400 pages, summarizing each mission and the fate of each crew from the 303rd's first mission in November 1942 to its final 364th mission in May 1945. "The third volume is a special set of two books called, "The Order of the Purple Heart." This 365-page volume includes the names and circumstances of those 303rd members killed or wounded in action, and information on where 467 members of the 303rd are interred or memorialized in nine American national cemeteries in Europe." In the March 13th ceremony, The JIOCEUR Joint Analytic Center Commander, Marine Corps Colonel Peter H. Devlin will host Lt. Col Miller's daughter Ms. Suzanne Wilson who lives in Deenethorpe, England representing her father who at age 87 is unable to travel to the ceremony.